A seed from the shea tree, or vitellaria, is where shea butter comes from. It’s a nut! The tree is native to Africa and produces a little fruit that looks like big plums. Our Whipped Shea comes in three different varieties: lavender or peppermint-scented, and unscented. From the looks of it you might guess we scraped the icing from a decadent cake—it really looks that luxurious—but we don’t recommend eating it. Instead, try it on dry spots like elbows, knees, and hands right after a bath or shower. Shea butter is an incredible moisturizer and helps to soothe rough and hardened skin. You can use it all over where you would normally apply your moisturizing products. Did you know there is an American Shea Butter Institute? 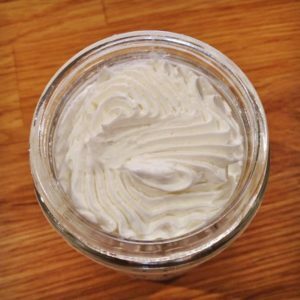 You can find all sorts of interesting articles about Shea butter and the skin conditions it can help treat along with its properties and origins at http://www.sheainstitute.com. How Wake got its name!